Sunreef 80 Sailing LEVANTE sports comfortable accommodation for 8 + 2 guests in one main deck master and three guest cabins located below deck, all ensuite. The starboard features the kitchen equipped with state-of-the-art appliances and one of the guest cabins while the portside has one cabin for children and one guest cabin. 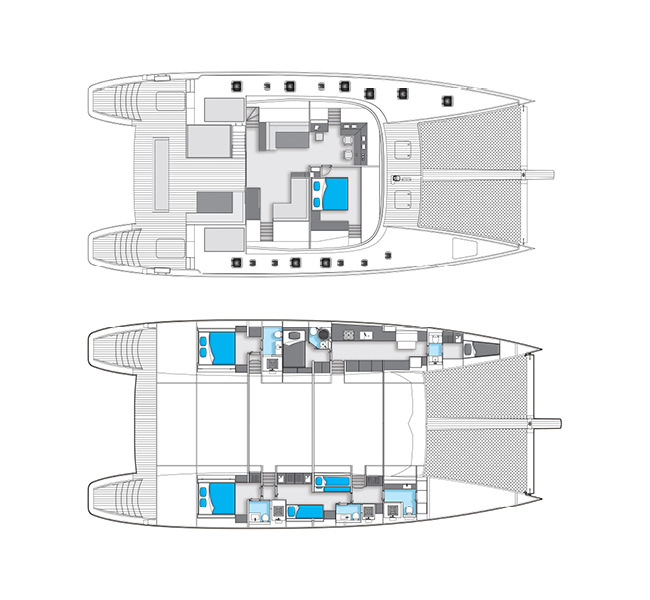 The master ensuite bathroom and large dressing room are also located on the portside below deck and have direct access to the cabin on the main deck. Captain Lucas discovered his true passion for the water at an early age when sailing with his parents and prior to professionally navigating super yachts, he successfully took part in numerous sailing championships. Experienced and prudent, he makes the safety of his guests and crew a major priority. Keen on travelling, Captain Lucas is excited to share his pleasure of sailing with the guests and show the most wonderful places in the world on board luxurious LEVANTE. Apart from being a good osteopath, Margot has a lot of experience in hospitality, restaurant and marine industry. Over the past three years she has sailed around the world as a deck hand, cook and stewardess, learning a great deal about maintenance, handling and life at the sea. This combined with her attention to details, accuracy and excellent knowledge of etiquette makes her a valuable crew member. Antoine grew up in the family with long-standing culinary traditions and it came as a natural progression for him to become a professional chef, working in luxury hotels and Michelin starred restaurants in France and Ireland. Today chef Antoine is on board LEVANTE to bring the best he can to his guests, from a family style lunch to a gastronomic multi-course dinner along with his fabulous pastry masterpieces. Emilie’s love for hospitality and serving industry has grown from the start of her career having helped her parents in the family restaurant. Wishing to learn what the best service can be, she worked in 3 Michelin starred restaurants and a 5-star hotel. Joining the yachting industry four years ago, she skilfully combined her professional experience with a passion for sailing, snorkelling, diving and traveling, which made her a perfect crew member.